Jimmy did not commence painting until 2004, however, he was already attracting attention by the time the 2005 Desert Mob was held. 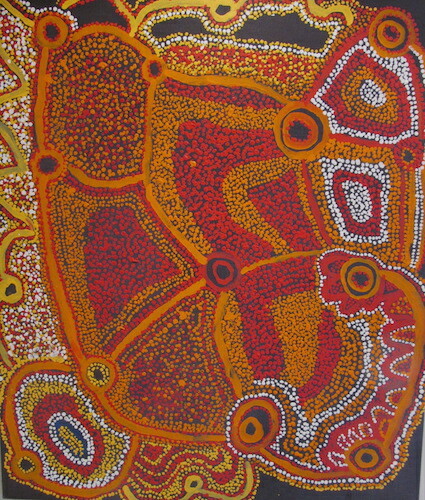 In 2007, Jimmy was a feature artist in the National Indigenous Art Triennial `07: Culture Warriors Triennial exhibition at the National Gallery in Canberra. Jimmy was a custodian of the important Kalaya Tjukurpa (Emu Dreaming) as well as a number of other dreamings. Interestingly, in talking to Jimmy, he made no distinction between himself and the emu in the story. The man and the dreaming are one. "Me, I'm the emu. Me. I ate that turkey. Me. I did. See here (pointing to his breast bone where he bears a scar the size of a 20 cents piece). See him there, that's where I ate him." Jimmy spent his finals years between Kanpi, Watarru and Alice Springs and passed away in 2010.